The company that brought us the Z-Star golf ball line and yellow to the premium ball market is at it again with a slogan that just sticks with me as I read through all the information and prepare to test this new product from Srixon. Question everything about your current golf ball. The Srixon Q Star Golf Ball is designed for players who are looking for an all-ability golf ball with STAR performance. The process of precisely tuning the Spin, Trajectory, Acceleration and Responsiveness (STAR performance) during development enhances total playability on every shot, increasing your ability to shoot lower scores. Is it time you question whether or not you are playing the right ball? Is a tour type ball right for your game? If much of your spin is side spin, why do you want more of it? Golf4Her Ambassador Mallory Blackwelder will compete in Big Break Ireland this fall! Looking forward to seeing what you think of these. 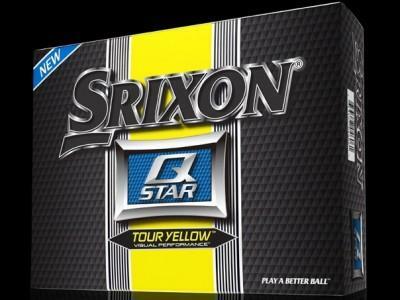 I am already a Srixon ball fan and these fall into a nice price point for me. I’ll be very interested in this review. Srixon makes some awesome golf balls, and this could be a great price/performance option for many people. I like this concept. Very catchy tag line with these balls. For that price I’ll question just about any ball and give these a shot. I like all around.. Looking forward to giving these a spin. Interesting. We need to get these in hand to learn more. I can’t claim to be a past fan of Srixon Golf balls, but these will get a try. Anthing the claims “all-ability” and “Question Everything” (pretty bold), deserves a shot in my books. I really love their z star x line – it’s my ball of choice – I will definitely give these a shot! The Z-Star is my second favorite ball (behind the B330-RX, which fits me better). I’m curious how the Q-Star will perform as perhaps a lower priced option when I don’t want to spend $43 on a dozen Bridgestone’s. A great price point if it performs. I’m assuming this is a 2-piece ball since they just mention a core and cover? I was a huge fan of the Z Star line of golf balls. I hope this is a shaft to less line of golf balls but one that fits a lot more people if that makes sense. So many choices out there it can get confusing. Cant wait to see how this one performs. Wow, looks really interesting. I will give these a spin for sure when they are released in Canada. Sign me up! I’m a big fan of Srixon golf balls. At this price point, I will definitely give these a try as soon as I see them in the store! I want to try this ball! I am going to have to get a dozen soon. Can’t beat the price. At that price point and with those performance claims I guess the Tri-Speeds will be going away? whose going to pay extra for the TriSpeeds if these do everything they say thay do? The tagline and price point are more than enough for me to want to try this ball out! I can’t wait! I really like this all around. And the price point really makes a statement too. I question everything already! Can’t wait to hear how this ball goes for you JB. Looking forward to hitting these….love the price point!!! I love the Srixon balls. My usual ball is the AD333. I’d give these a whirl. I will deff look into these balls.I like that they are a good performing ball at a reasonable price. Ive never played any srixon balls but i think i my give them a shot to see how they are. I love the Z star, this looks sweet too. This is going to be an interesting ball to try out. Sounds a lot like the Nike One Vapor (the original, not the new Vapor Speed). I’m interested because it’s getting nearly impossible to find the old Vapors and I’ve resorted to getting mint quality used ones. These look awesome. Sounds like they have everything I want in a ball, so I hope to be trying them soon. Tried this ball, great distance, doesnt spin too much around the greens soft off the putter and you can see it in the rough…oh and cheap too…!! Very dissatisfied with this ball. Did not excell in any category. Distance was very middle of the pack, but then again, I find all Srixon balls to be shorter @ my swing speed ( 85 to 90 mph ). I purshased one dozen to give it a fair chance. I’ll let my wife have the balance – she thinks the yellow is cool. I just played 18 with this ball. The ball is outstanding, longer by 15 yards than NXT’s and better feel. The ball checks very well on the green. It also feels great off the driver and the irons. Highly recommended, and the price is great too! I have only used Srixon AD333 balls for 15 years after trying most “soft” balls on market. Swing speed 80 MPH. My wife uses Srixon Trispeed balls. We both play 4 days/week and shoot in the 80s. Tried Q stars this week end and found them not as good for distance or feel as the AD333s and Trispeeds which they are going to replace. And more expensive by $5/doz than AD333s. My wifes comment was that they were awful; her friends was they were not good; mine is that they are not as good for distance as AD333s and don’t understand why they are marketing a new ball for a higher price which is obviously not as good as their existing products. If you have a slow swing speed, try them and then try an AD333 and see if you would pay more for a Q star. Played These Yesterday. So Good I Bought 2 More Dozen! Long With Great spin Around The Greens, Nice Soft Feel off The Putter.